J.R. Vernick co-founded RDS Solutions 11 years ago to help customers navigate what was even then a "challenging and frustrating" telecom market. So is he surprised at how turbulent it is today, with some carriers eyeing the sale of their once-prized data center assets? Not one bit. "If you were only working with carriers, you weren't doing a good job," said Vernick. "They aren't the right play for every client." Even though large carriers account for about one-half of RDS Solutions' sales, the Clifton, N.J.-based company is finding increasing success with tier-two cloud providers. "The small providers can be more nimble," said Vernick. These fast-moving cloud service providers are winning over solution providers by offering access to top cloud services technical talent and sales support along with robust recurring revenue commissions. That's in sharp contrast to the single-digit margins provided by carriers attempting to compete in the cloud services market with the likes of Amazon Web Services and Microsoft. Amid the carrier churn, Vernick recognizes the potential threat of lower cloud commissions if a carrier's data center assets are sold to a company that is not channel-friendly. "If one provider is selling off a base of business that the partner is being compensated on, that's always a potential concern," he said. "That's why you have to hope that whoever is buying [those assets] is channel-friendly." Also amid the chaos is the emergence of a new breed of solution provider: strategic service providers, which are building their business by driving a higher percentage of sales from recurring revenue cloud services. Many of these strategic service providers also are taking a pass on building their own data centers and are instead establishing relationships with regional service providers or global service providers. 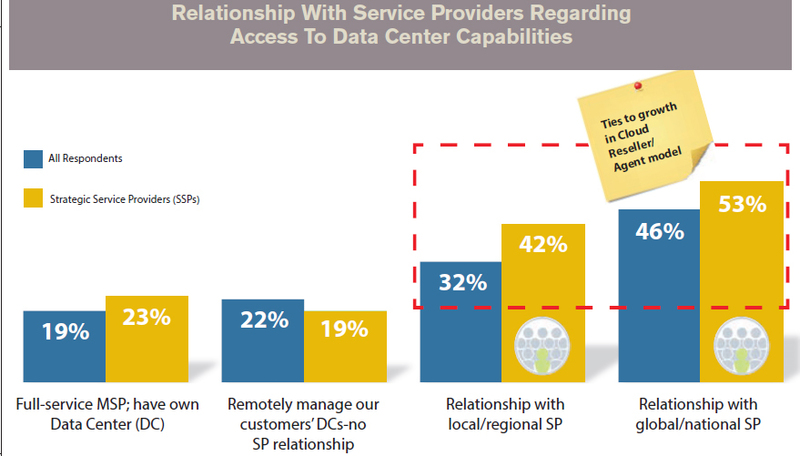 A survey by The Channel Company, the parent of CRN, shows that 42 percent of strategic service providers have a relationship with a local or regional service provider, while 53 percent have a relationship with a global or national provider (see chart above). "We will never have our own data centers," said one solution provider executive who participated in the survey. "We don't want to compete with Microsoft and Amazon. Having your own data center was a great model about 10 years ago." Windstream, Little Rock, Ark., was one of the first carriers to move out of the data center space, selling its data center and colocation business to data center operator TierPoint in November 2015 for $575 million. "It takes so much capital to run the data centers, so the telecoms of the world are getting back to their roots. In the future, the cloud companies are the ones that will be selling cloud," said Jason Dishon, Windstream's channel chief and vice president of channel sales and operations. With the sale of the data centers, Windstream has revamped its channel program to give partners serving enterprise business customers access to more resources and dedicated support. Windstream's channel program now includes dedicated sales engineering, support, and order coordination and management resources in the form of tools and support staff. Verizon, for its part, bought highly respected cloud service provider Terremark in 2011 for $1.4 billion. Five years later, the Basking Ridge, N.J.-based company said it was closing its public cloud business effective April 12. The company urged users to migrate to its pricier Virtual Private Cloud offering or find another cloud alternative. The exit came after Verizon CFO Fran Shammo told Wall Street analysts that the company was eyeing selling its data centers in what he called an "exploratory exercise." He said Verizon was evaluating whether its data center assets were more valuable inside or outside its portfolio. Should the carrier decide to leave the data center space, it will continue to offer private cloud services for enterprise customers, said Dan Jablonski, director of IT solutions product management at Verizon Enterprise Solutions. "Ultimately, the infrastructure at the bottom only matters so much. What matters is the business outcome from the applications that run on top of it," said Jablonski. "At this stage, chasing after Amazon and Google and Microsoft from a public cloud perspective is a fool's errand and we aren't interested in it anymore." Verizon, however, is interested in stepping up its channel push and recently rolled out a Value Added Distributor Program that includes Synnex, aimed at helping the telecom giant sell its networking, security and managed services—starting with its Rapid Response Retainer offering—to more traditional solution provider partners. Like Verizon, Monroe, La.-based CenturyLink made a big cloud services bet five years ago with the acquisition of hosting giant Savvis for $2.5 billion. At the time, CenturyLink CEO Glen Post said he viewed the deal as a game-changer combining Savvis' managed hosting and co-location with the CenturyLink network. Fast forward to November 2015, when Post said CenturyLink would be exploring options for its data center operations and colocation business that could include the sale of some or all of its data center facilities. "For partners and for us, it's not about the product," said Blake Wetzel, vice president of CenturyLink's Channel Alliance program. "It's about facilitating the workload in the right cloud environment—whether it's in our environment, or in AWS, or [Microsoft] Azure, for example." CenturyLink is also beefing up its security footprint with the acquisition last month of security firm netAura to bolster its managed security services portfolio. Though successful in their own core telecom services, the carriers' cloud services divisions have had a harder time gaining traction in the channel. As a result, some of the telecom giants are suffering from an identity crisis of sorts. Once the cloud services market began to heat up, carriers saw a big opportunity to buy these highfliers and tie together the telecom PBX and data network into a unified cloud voice/data network. But pulling off that vision as Amazon Web Services, Microsoft and even Google are engaged in a vicious cloud infrastructure price war has left the carriers scrambling for higher ground. In the midst of the carrier fallout, Google has continued to aggressively build out a global data center infrastructure. The Mountain View, Calif.-based company has four cloud regions worldwide—compared with 12 for Seattle-based Amazon Web Services—but is preparing to open new regions this year in Oregon and Japan, Bloomberg reported in late March. By the end of 2017, Google is planning to build or lease facilities in an additional 10 regions worldwide, according to Bloomberg. Solution providers see Google's data center building campaign as a sign that Diane Greene, the co-founder and former CEO of VMware who joined Google in November as senior vice president of enterprise business, is serious about raising the vendor's profile in the enterprise cloud space. "Google is absolutely making the right move by launching additional cloud regions," Tim Wagner, president of the commercial business unit at DMI, a Bethesda, Md.-based Google partner, told CRN. "The majority of our largest customers have a global footprint and require local cloud access based on the criticality of their cloud-based infrastructure." Evolve IP, a Wayne, Pa.-based cloud service provider, is an example of the emerging class of tier-two, niche cloud players winning over solution providers. Evolve IP owns six data centers scattered throughout the Midwest and focuses its contact-center-as-a-service and cloud computing offerings squarely on midmarket customers. "We have a niche support model around cloud...we don't even attempt to compete with the large cloud providers," said Scott Kinka, chief technology officer and founding partner of Evolve IP. Carriers struggle to compete in the cloud space because they can't outspend the market heavyweights, but they also aren't structured for the supportive, high-touch relationship with their customers that more agile cloud service providers and their partners are bringing to the table, Kinka said. The new class of cloud service providers such as Evolve IP provide partners with high-level pre- and post-sales support and technical services. It's not about simply selling space in a rack, Kinka said. For its part, Peak 10, a Cisco Powered IaaS provider, owns 27 data centers and is looking to pick up more real estate by the end of the year as business grows, according to Steve Harris, senior vice president of national alliances for Peak 10, Charlotte, N.C. The cloud service provider sells both directly and through its channel of partners, with indirect sales accounting for about 40 percent of revenue. That scale is tilting rapidly in favor of the channel, however, Harris said. Carriers aren't equipped to cater to partners to the extent that a smaller cloud service provider can, said Scott Lee, vice president of channels for Matrix IBS, a Columbia, S.C.-based cloud service provider. In fact, the biggest differentiator for the tier-two cloud players is that elevated level of support and sales assistance, Lee said. "Customers have told us that they don't think these larger carriers really hear what they are asking for, and that's what's causing so many partners and customers to say, ’We're done with the big guys on the compute side because unless we're a large enterprise, they don't want to spend the resources on us,'" he said. Only those cloud service providers capable of guaranteeing a specific level of support are going to be left standing in the end, said Neely Loring, president of Matrix IBS. "What the big carriers are incapable of doing is being agile enough to give people what they really want to buy, and that's the experience around cloud," Loring said. Matrix IBS owns its own data center in South Carolina located near its headquarters and also leases space in two third-party data centers in Milwaukee and Phoenix for geographic diversity. Loring believes that the cloud is becoming less about the technology and more about the support, Loring said. "No matter how cool the data center is, it doesn't really matter if you don't have a partner in practice," Loring said. Service-level agreements and how much support customers can expect if they run into a problem are key, according to Loring. "The question of where the data center is and who owns it probably comes up about 15 percent of the time," he said. Meanwhile, MetTel, New York, has a large base of data center operator customers. MetTel provides connectivity to many regional data center facilities. "With carriers getting out of this space, we might actually see an increase in what we are selling to these [regional] data centers," said Dave Mitchell, vice president of sales, agent channel for MetTel. "For a lot of customers making the transition to the cloud, they like to be able to walk into the room where their data is held," Mitchell said. "It seems like midsize customers don't have that level of comfort to drop off their data and leave it alone [when] they can use the data center that they drive by all the time." Partners and end customers also have the luxury of going to the data center location to talk about security, connectivity options, and other solutions that can be tied into their purchase while seeing the facility for themselves. Smaller is often synonymous with dexterous, and a boutique cloud service provider can be more agile with partners than a large provider can, according to Max Silber, vice president of mobility for MetTel. "I don't think the carriers have been able to overcome the fact that customers are choosing what is accessible and convenient to them—I don't think these customers ever went to [their carrier] to discuss moving into one of their large data centers," Silber said. By working with partners, smaller cloud service providers are able to reach small and midmarket customers and help solve unique problems, said Andrew Pryfogle, senior vice president of cloud transformation for Intelisys, a Petaluma, Calif.-based master agent that partners with both carriers and smaller cloud service providers. More and more of these channel-friendly, or channel-only, cloud service providers are popping up, RDS Solutions' Vernick said. "The trend now seems to be pretty pro channel partner. I think cloud providers are seeing that partners understand their customers, understand their needs, and are seeing the results," he said. RapidScale is an Irvine, Calif.-based cloud service provider that targets the SMB market and sells exclusively through the channel. At its inception in 2008, the cloud service provider realized that the majority of direct cloud sales were very small. Many business buyers purchased IT solutions through a trusted solution provider that provides the entire package—expertise included, according to Randy Jeter, CEO of RapidScale. RapidScale is seeing traction in its channel-only approach to the market. The cloud service provider has grown at a steady clip of about 160 percent annually for the past three years. Thanks to its relationships with master agents, VARs, managed service providers and SaaS provider partners, RapidScale recently said it would add to its fleet of cloud sales engineers and regional channel managers to help more partners. And by enabling large partners that consider cloud solutions to be a must-have within their portfolios, RapidScale gains thousands of feet on the street, which helps it compete in the crowded cloud market, Jeter said. "Our partners have our platform they can build onto. Because they don't have to build it, they [make] a great margin," he said. RapidScale leases space with third-party data centers and owns everything inside its data center space, including compute, storage and delivery. Many cloud service providers are following this model of leasing space within third-party facilities because there's been a palpable shift in the market in favor of managed cloud and away from "platform buying," Jeter said. This is the same shift that is allowing cloud service providers like RapidScale to blossom, without requiring them to put the same capital into the cloud that telecoms have sunk into data center investments, he said. "There's enough revenue and margin for a company like ours to support, manage and deliver, instead of just trying to just acquire [data centers]," he said. RapidScale's facility cost associated with the cloud is about 3 percent of its overall cost to deliver services to its users, Jeter said. That cost rises drastically for data center owners. "If [facility] costs are high, carriers aren't going be in the space for very long because they'll have to compete in the mass market with the large [cloud] providers that have the money … and facility costs are always increasing," he said. For its part, Cirrity, an Atlanta-based channel-only cloud service provider founded by CEO Steven Vicinanza, who built Blue Wave Computing into one of the country's top MSPs, is also finding success in the channel. Vicinanza says the simple secret to the company's success is its 100 percent channel commitment. "Because our success is dependent on our partners' success, we have to enable them to be successful," he said. Ron Dupler, CEO of GreenPages Technology Solutions, a prominent national cloud solution provider based in Kittery, Maine, said Cirrity is one of the key "strategic" partners helping GreenPages drive double-digit sales growth in cloud services. "The big traditional carrier service providers don't have the channel DNA that Cirrity has," he said. "They just don't get it. Cirrity was founded by someone that was a VAR. He knows the channel psychology. We have direct access to Cirrity's CEO, CTO and CMO. We are collaborating directly with the executive team. That is helping us innovate and grow our cloud services business." Just because some carriers are leaving the business of data center operations doesn't mean they are abandoning their cloud strategies, said Cindy Reid, CEO of 2Evolve Technologies, a cloud, telecommunications and IT solution provider. Omaha, Neb.-based 2Evolve Technologies is an example of a company that is increasingly relying on tier-two data center providers—including Evolve IP—for its own data center and service distribution needs. At the end of the day, running a data center is a real estate business. If a carrier elects to put its servers in a third party's data center, it shouldn't impact the cloud services being provided and sold by partners, Reid said. "We are going to see data centers transition to operators that are more successful in that real estate space as opposed to the services space," she said. The sale of Windstream's data center business hasn't changed cloud commissions for partners that were selling Windstream cloud or data center services, according to Dishon. Following the sale, TierPoint took a number of cloud partners that had already established relationships with Windstream. "[TierPoint] hasn't changed the channel format—it's pretty much the same across the board so far," Dishon said. Because TierPoint is a "channel-friendly" provider, said Dishon, Windstream didn't have any qualms handing over its co-location business. TierPoint also established Bob Buchanan, Windstream's former vice president of channel sales at Windstream Hosted Solutions, as its vice president of channel sales in order to maintain consistency for partners. Regardless of data center ownership, the agent partners that carriers relied on for cloud distribution still want to sell cloud services, 2Evolve's Reid said. "A good portion of our own distribution is coming from the same telecom agent channel that was bringing cloud opportunities to [the carriers], and 2Evolve has made significant investments educating the telecom channel on cloud services," she said. As some of the large telecoms eye a data center exodus, Peak 10 hopes to pick up some of the more traditional telecom agent partners, Harris said. Tier-two players such as Evolve IP, Matrix IBS and RapidScale could also stand to win some of the cloud business that carriers couldn't grasp. Evolve IP has been taking on new telecom agent partners recently through its partnerships with master agents Intelisys, Malibu, Calif.-based World Telecom Group, and Chicago-based Telecom Brokerage Inc, Evolve IP's Kinka said. "While I can't say for sure if it's a conscious thing to do with carriers leaving [the data center] space, a good portion of the new kinds of partners we are getting come from that same channel," he said. It's safe to say that carriers won't be getting out of the cloud services business anytime soon. This year, Intelisys expects 22 percent of its overall sales to be cloud compared with 15 percent in 2015. The master agent said that cloud is by far its fastest-growing segment. Meanwhile, data center consolidation will continue, but so will expansion because there's room for more players looking to get into data center services, MetTel's Mitchell said. "I think there is definitely room for more providers, but they'll have to be niche providers," he said. "There's a ton of small and medium-sized businesses out there that don't feel comfortable putting their data in a carrier cloud." When procuring cloud services for customers, it's about comparing offerings, not physical data center assets, RDS Solutions' Vernick said. Decisions around cloud usually often come down to location for many customers. "The customer is usually going to dictate the location that they would like to be in and the latency they need to make their applications work, so we help them focus on finding the right provider for them in that area," Vernick said. For many customers—especially small and midsize businesses—there's a certain comfort in knowing their data is being housed locally by a smaller, regional provider. For RDS Solutions, every opportunity is unique. "Every client is different, every need is different," Vernick said. "It's about finding the right fit for the customer and sometimes that means it's a small, local cloud service provider like Matrix IBS or RapidScale," Vernick said.